During 1974, while exploring clifftop scrub overlooking a valley, I encountered a remarkable sight. As I entered a clearing, standing a few metres away, stood a huge sandstone rock resting upon a large ironstone platform, weathered with immense age but bearing the unmistakable features of a human, yet reptilian-like face. At first I decided the ‘face’ was a natural formation, yet it looked interesting, so I climbed onto the platform for a closer inspection. Here to my excitement, I found upon a large ironstone slab lying beneath the ‘face’, symbols which I realised to be the [then] mystery Uruan script. Upon climbing onto the ‘head’ of the ‘face’ I discovered another set of glyphs. I now began examining this great formation more closely. I observed that it stood on an east-west axis, the ‘face’ being at the eastern end. A view of the stone alignment pointing south-west. Some of the stones are inscribed . Photo © Rex Gilroy 2004. At the formation’s western end, but pointing south, I discovered a large stone resting upon the base rock, shaped in the unmistakable form of a serpent’s head with eyes and mouth deeply cut. Atop its head I found two more large glyphs, a stroke and circle, now translated as “N M” - Nim. I now realised the face had in fact been shaped by human hands, although great ages of wind and rain had taken their toll. The structure bore the unmistakable features of a sphinx, although far older than any Egyptian example. Newcastle geologist, the late Dr Harold Webber, who examined it later, believed the rate of weathering placed the monument at around 10,000 years old [ie the early “Middle Advanced Uruan” period], but cautioned that it could be much older. The Sphinx rock itself is 4m tall, which together with the base platform gives a total of about 5m. The base platform is 8m long by 5.8m wide. The Sphinx rock is 1.8m wide at the head by 3.2m long. 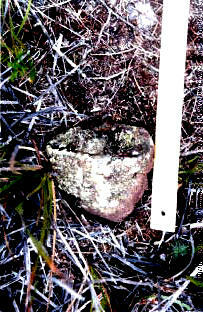 The serpent head at the rear is 90cm tall by 2.4m long, being 2.1m wide. The Uruan Sphinx overlooks a large flat area, which although now covered in trees, had been cleared in antiquity, and a sandstone slab wall constructed, containing the cleared land and sphinx within this square enclosure to create a unique Sun-Worship temple. “At this temple I, the Serpent, am to be worshipped as the Sun”. “The Sun-Bird, the Eye of the Sun. See his voyage across the heavens”. The inscription atop the serpent’s head read “Nim”, identifying the site as an ancient Uruan Sun-Worship temple. The stone wall that formed the enclosure is now but piles of scattered rubble, yet work at this site is far from complete and further discoveries may yet come to light hereabouts. This remarkable monument, and many more to follow in the course of this book, are timeless reminders that Stone-Age Man was not always the cave-dwelling primitive [at least in Australia] that conservative archaeology would have us believe. Here, for the first time, I had revealed the name of a local Uruan King. The inscription suggests King Na-si was preparing for war. The ships could have been meant for coastal waters or rivers, implying his territory extended to the coast [and probably some distance west]. 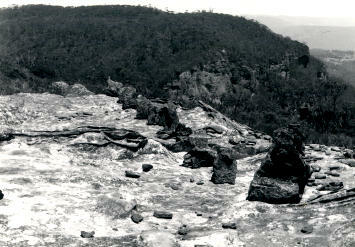 Na-si appears to have ruled from somewhere on the Blue Mountains, but where and how long ago? The monarchs who ruled these mountains and worshipped at these temples in the clouds, wielded considerable power, enough to command the construction of ships and the raising of troops. of the Sun** gives praise.” [*pronounced ‘shoog’. Wherever King Shug’s residence was located, it would certainly have been a well-fortified bastion, defended by an army of warriors, and the home also of the priests who served the shrines, temples, altars and astronomical observatories of the district. Nineteenth century Blue Mountains settlers were informed by Dharuk tribesmen, that the monolithic formation rising up out of the Jamieson Valley south of Katoomba, and now known as Mt Solitary, was in reality a sleeping giant male ancestral being. The formation, which extends east-west across the valley, does give the impression of a reclining giant human figure; the outline of its eastern cliffs resembling a head with a prominent nose, and a flowing beard descending eastwards down into the valley in the form of a ridge. The name “Sleeping Giant” lived on well into the 20th century among ageing residents. 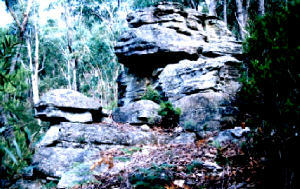 Early Aborigines of the region are believed to have regarded the nearby Three Sisters rock formation as the lubras of the “Sleeping Giant”. The giant male ancestral being, they believed, was one of a race of giant people called Jogungs, who had been turned to stone from the bite of the “Giant Serpent” - Narrow Neck Peninsula - while to the south-west of the far end of the ‘Neck’ stand the Wild Dog Mountains, which tradition had it, were the giant’s pet dingoes, who having failed to save their master, turned to stone waiting for him to return to life. It is significant that these natural formations formed part of the local Uruan culture, as deduced from the great number of rock engravings and structural remains found upon and around them by Heather and I. The greatest concentration of these centres of worship and astronomical observation appears to have been out on Narrow Neck Peninsula to the southwest of Katoomba township. Here hundreds of people appear to have congregated at various times, for ceremonies and religious observances at the numerous shrines and temples that covered the plateau, and where astronomer priests carried out their observations.